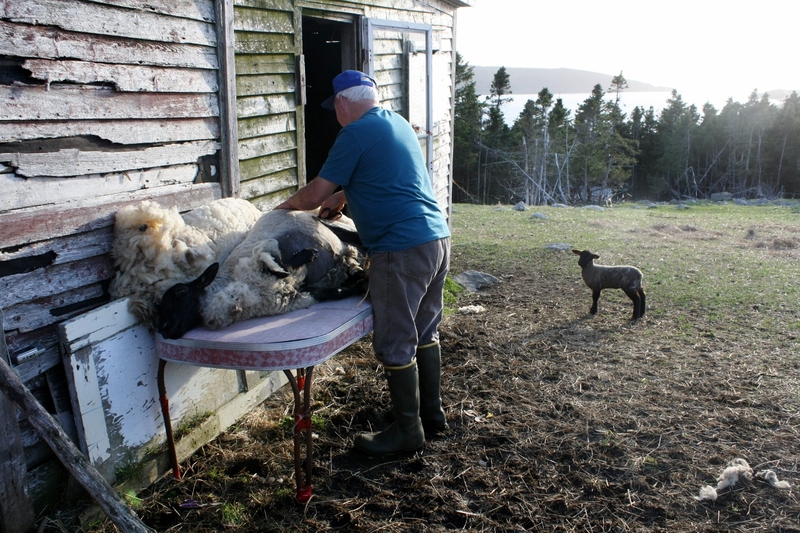 Yesterday evening Tolson Rendell of Heart's Content invited me to observe him shearing one of his sheep. It is a tradition that only two people in the town still practice, the other being his good friend Jack Smith. Tolson will be putting his animals out to pasture for the summer this coming weekend, so has lots of work to do before then. It usually takes him just over 2 hours to fully shear a sheep, and he uses scissors rather than electric shears because he believes them to be safer for the animal. He takes his time and makes sure to do a thorough job. Tolson clearly loves his animals and exclaimed "Isn't nature wonderful!" more than once during my visit. There were many newborns animals around the yard, and I couldn't help but notice how happy Tolson was to see them running around. This photo shows the mother sheep named Black being watched by her new lamb, who wasn't very patient about waiting for this whole shearing thing to be done.